Robert Davine Interview with Bruce Duffie . . . . .
For the past several years, I've taught a class called Introduction to Music at Northwestern University. It's strictly for "non-majors," in other words, those who are not pursuing a degree in music. Those in my class will be doctors, lawyers, journalists, scientists, politicians... in other words, they'll have 'real' careers. (Musicians who read this will understand the joke.) It's my job to lure these bright young minds toward the wondrous world of classical music, and to instill in them a joy of discovery which, it is hoped, will last the rest of their lives. At least that's what I set out to do. My instructional technique presents topics. Not a time-line as is the usual format, but ideas or concepts which allow for illustrative musical examples. Each family of instruments gets a day - woodwinds, brass, strings, percussion, keyboards. I spend one lesson turning each of them into conductors via time signatures and expressive gestures. We study the voice in three sessions - men, women, chorus. We listen to Asian composers and Alaskan composers and women composers (though that detail is not revealed until the very end!) and even music about birds and transportation, and music composed by statesmen and politicians - Henry VIII, Frederick the Great, signers of the Declaration of Independence. But one of my very favorite sessions is devoted to "odd instruments." After we've gone through all the usual ones, we look at the really strange ones - the glass harmonica, mouth harmonica, carillon and a few others. Plus the accordion! I look them in the eyes and say (in a funny voice), "Bet you never thought you'd hear THAT in a classical music class!" They're mystified, but often they're hooked. And that's my goal. One of the many who help make that goal possible is Robert Davine. He attended Northwestern, and in 1992 he was back to play a concert. A decade before I started teaching at NU, I was on the radio and was always looking for the unusual. Here was my chance to add the accordion to my playlist. A gentle soul playing a rather rugged instrument, Davine was pleased to chat with me about his work. A biography of the artist from The Free-Reed Journal appears at the bottom of this page. Names which are links refer to my interviews elsewhere on my website. Here is what was said that afternoon. . . . . . . . . . .
Bruce Duffie: How do you make sure that people understand that you're playing a concert instrument and not Lady of Spain? Robert Davine: It's difficult because many people believe the only thing that you can do is Lady of Spain-type of music! So in order to eradicate that, the best way, obviously, is through exposure and by doing concert material. I know of no other way other than either playing actual live concerts, or through recordings. BD: Do you play some transcriptions as well as new works? RD: Yes, yes I do. BD: Do you make the transcriptions yourself? RD: Some I have and some are published. BD: What are some of the specific difficulties, or perhaps easy ways of getting a piece of music from a piano work or an orchestral work into the accordion? RD: The difficulties, of course, if you take an orchestral work you want to try to get as much of that composition, harmonically and contrapuntally, that you possibly can. Many times that's impossible. It depends on the texture of the music. And there are certain solo things that simply do not lend themselves to the accordion, such as Chopin. The ballades would be next to impossible to really do successfully. BD: Why? What about them doesn't work? RD: The arpeggiated type of left hand and the pedaling that you have on the piano. The accordion is more allied to organ-like texture, for instance, a Bach prelude. Many of those work very well, especially if they were written for organ. You don't have to change much. BD: The accordion essentially is a reed organ. RD: It is a free-reed instrument, simply meaning that you have steel reeds set on blocks of wood that are allowed to vibrate at a given pitch. They're tuned chromatically. The reed is secured firmly at one end and then allowed to vibrate at the other end. That principle goes back to 300 BC, to China and an instrument called the sheng. BD: With an organ, though, you have constant air pressure, whereas on the accordion you have to breathe almost like a singer. RD: Absolutely 100 percent correct. You breathe. You might think of it in terms of a woodwind instrument or the bow on a string instrument. It's that kind of concept. The pressure or lack of pressure can give you a whole different quality of sound, depending upon how hard you're forcing the air through those reeds. BD: And I assume if you're forcing it harder to make a bigger sound, you have less time before you have to start going the other direction. RD: It uses more air that way, and also depending on the registration. If you have all the reeds vibrating, it takes considerably more air than it would if you're playing soft. BD: You mentioned registration. Like an organ, you have different controls that can get different sets of reeds to play. RD: Absolutely. On a standard instrument you have four sets of reeds in the right hand, and if you figure it out mathematically you can come up with ten different stops, or registrations. They are preset on the instrument; you don't form those yourself. BD: In the right hand you have what looks like a standard keyboard and on your left hand you have a series of buttons. RD: The buttons on the standard instrument are a combination of single bass notes and sets of chords - major, minor, dominant seventh, and diminished. RD: Yes. And you can form other chords using more than one button; you don't have to just stay with one button. So you can play the root of the chord, with a single bass note, and then the chord coupled with that. So you get a considerable amount of sonority that way. There are instruments known as free-bass instruments, or sometimes called the bassetti, where you have totally complete single pitches, simply like you would in the right hand, and you form your own chords. And you have a greater range in the left hand, some three to four-and-a-half octaves. BD: Wow! I didn't realize it was that big a compass. You mention "standard" instruments. Obviously there are some standard instruments and some, perhaps special instruments. RD: The free bass instrument is, in one sense, special because it isn't used to the extent as what we know as the standard instrument, known as the Stradella, with the bass plus the fixed chord. There are instruments that can convert the left hand to those single bass notes if you want to use them, or you can convert back to the standard chords. BD: Have you tried to get the manufacturer to make a specialized accordion for your use? RD: No. As far as I'm concerned, it isn't so much a matter of range but more a matter of the sound, and the quality of that sound, and how it blends with other instruments for the kind of playing I do. BD: Was the accordion your first instrument? RD: No, the piano was my first instrument and then I became fascinated with the accordion as a child. BD: I was going to ask why you gravitated toward it. RD: Originally it was simply the physical cosmetics of that instrument just fascinated me. To see someone play that instrument was the original fascination. And of course the sound; I couldn't get over the sound as a child. It simply just grew on me, I suppose, and I've played in school programs, every school show I could possibly play. Needless to say, that kind of thing gives you more popularity, and I really enjoyed that kind of activity. BD: At what point did you gravitate away from playing popular-type music to playing more serious concert music? RD: It was probably my last years in high school. I was fortunate to study with a very good teacher who exposed me a lot of transcriptions. In those days there were original things, but they weren't real serious, so to speak. 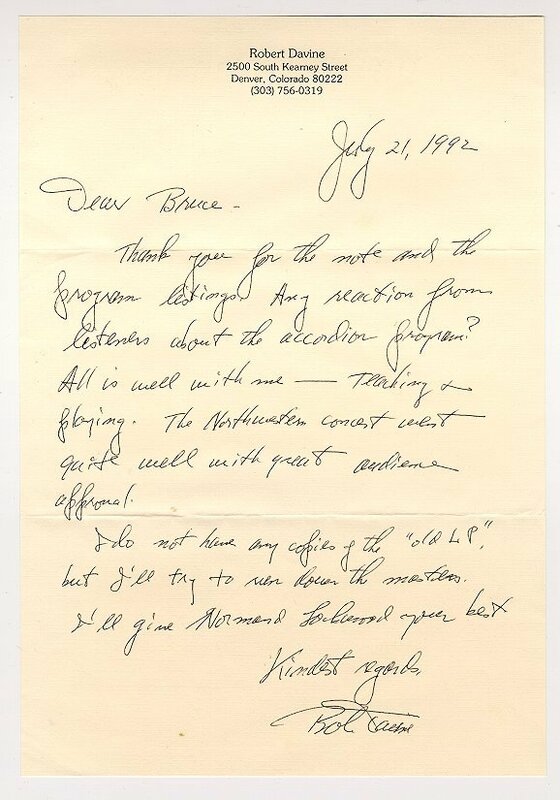 But it was at Northwestern that I was in a chamber music class. The gentleman that taught it was a wonderful violist. He asked me what instrument I played, and I told him I was a trumpet player but that I also loved the accordion. He was very encouraging about looking into the possibilities of that instrument because he himself was from Belgium, and told me that they used the accordion extensively, not only for folk music, but for concert music. I also studied with Andrew Rizzo at NU, who was certainly, at that time, one of the fine teachers of this country. He also opened my eyes to what the accordion really was about. BD: I assume there are a lot of people who simply play the accordion, but are there very many people who play the accordion as a concert instrument? RD: There are many highly talented people, young people, who play wonderfully well. The problem is there's not much outlet, and people don't hear it very much, as you alluded to before. So there are some very fine players who are interested in concert music. BD: Is it your mission to make it more available? RD: I'd like to do that; I don't know if it's my mission, but I enjoy working with composers who are interested in writing for the accordion. They always open up new vistas in terms of sound and experimentation with various registrations and textures. So that's what makes that fun. I feel that the big problem with the accordion is its exposure and the literature that you work with. You can be a virtuoso player and not play very good literature, and then serious concertgoers aren't going to necessarily appreciate it. BD: Then you're wasting your virtuosity? BD: What advice do you have for someone who wants to write a concert piece for the solo accordion, or accordion with an ensemble? RD: You mean how to they write for the instrument? BD: If someone comes to you and says, "I would like to write a piece for you; where do I start?" RD: The first thing that I would do is just sit down with him, and if they don't know anything about the instrument, try to explain the mechanics of it; what generates the sound and what some of the problems are, such as the minute you let your hand or hands off the keys or buttons, there's no sound. BD: It's the same as an organ. RD: Exactly. And I'd explain to them about the range. The problem that you have with the left hand in terms of chromatic lines is more difficult than it would be on a keyboard, as an example. These kinds of things would be first, and then I would show them music that has already been written for the accordion so they'd get an idea of what it really looks like, and, of course, what it sounds like. BD: How is the notation? Is it standard two-line notation like a piano part? RD: Yes, yes, it is. BD: So it looks like chords with a single line up above. RD: Well, it doesn't necessarily have to be chords; it could be single lines in both hands. There's much of that in the concerto by Carl Heinrich Graun, the late Baroque, written for the organ. Many of those bass lines are just single notes; there's just one or two places where it's chords, so the part looks simply like two single lines, many times. BD: You're expected to do the figuring of the bass yourself? RD: If you play the continuo part, but this is a solo part. BD: Have there been concertos written for the instrument? BD: Do you do any writing yourself? RD: I have. I've written a divertimento for three winds (flute, clarinet and bassoon) and accordion, and it's worked very well. In fact it is very difficult, sometimes, to tell that the accordion is really there, depending upon how you voice the chords, it blends so well with other instruments. BD: You mean they think it's more like the regular instruments and they don't think of it as being an accordion? RD: That's right! Exactly right. BD: When you're playing most instruments there are muscular problems that you have to deal with, such as holding a violin under your chin or playing the arm strength needed to play the piano. What are the specific muscular problems that you have with the accordion? RD: If you sit, like most concert players do, the weight of the instrument falls on the left leg, so therefore the left shoulder gets the brunt of it - at least with most players that's the case. So it's the left shoulder that you feel, or the left arm, also, because that's where you get your pressure for the bellows. BD: So the hands are not opening together, it's just the left hand which moves and the right hand stays very stationary. Then how do you make sure you don't wind up looking like Rigoletto, the hunchback? RD: Well, I suppose the thing to do is sit straight in the chair [chuckles] and face the music stand straight on. Also watch that you have the instrument as far to the left as you possibly can so that that weight falls on the left side, and that you're not cramped over. Like this [gestures], it should be more in front of you. BD: Tell me about the recordings you've made so far. RD: Years ago I made one for a Denver company, that's now out of business, called Premiere Record Company. [This LP is entitled Accordion Davine (P6102), and contains Toccata in D minor by Bach; Vivo by John Gart; Sonata in G minor by Thomas Arne; Spanish Dance no. 5 by Granados; Variations on a Ukrainian theme by Y. Kasakov; It Had Better be Tonight, Don't Blame Me; Love Your Magic Spell is Everywhere, Village Inn by Henry Mancini; I Wish You Love, What is This Thing Called Love by Cole Porter (arr. Mort Mann), Malagueña by Albeniz; with Robert Davine, accordion; Fran Feese, vibraphone; Bill Bastien, bass; Lee Arellano, percussion; program notes by Fred Arthur.] The Crystal album is the one that has done very well. BD: That has solo and chamber pieces? BD: Are you anticipating making more recordings? RD: I am. Crystal would like me to do a CD, and I'm looking forward to working with that company again. I'm not sure about the repertoire yet. I just got a score from a gentleman in California, a professor at Humboldt State University. He wrote a work for woodwind quintet and accordion. To my knowledge, I don't think there is anything else in that genre for woodwind quintet and accordion. BD: You play solo, you play chamber, you play concerto. Which of these do you prefer, if any? RD: I think the most challenging for me, really, would have to be chamber music. RD: Yeah, the blend, and the articulations and all of the problems and challenges that you have with chamber music. [Pauses for a moment] But solos, too, can be very challenging, needless to say. Nicolas Flagello [(1928-1994)] wrote a very fine piece called Introduction and Scherzo [(1964)], which was difficult technically and exploits the dynamic range of the accordion wonderfully well. BD: Now is this what you like, is to be exploited as much as possible? RD: I do. Not necessarily always technically, but certainly the dynamic range and the various articulations. I think that's what makes it interesting. BD: When you get a concerto or a piece of music, how do you decide if it's something you want to play, or if it's something you want to have tampered with and rewritten? RD: You go through it and if it appeals to you, either melodically, texturally or rhythmically, I really start looking at it. And the more you look at some things, the more sense it makes. If it's a solo piece, you look for the variances of these textures and registrations and all of these various avenues that you have at your call if called upon to use them with the accordion, rather than just playing it with one setting and one type of texture. BD: About how much does the thing weigh? RD: It weighs, depending on the instrument, somewhere between 24 to 26 pounds. BD: Is there anything about it that you have to maintain, or do you let the factory take care of all the cleanness on it? RD: [Interjects] There's not much you yourself can do except avoid extremes of temperature. Certainly cold weather will affect it. If you have it in a very cold place and then try to play it hard, you're gonna break the reeds. But you can't really do all that much in terms of tuning. It has to be done by a craftsman. That's hand tuning, and they file the reed in order to get the correct vibrations. BD: And is there any time limit about how long these reeds last inside? RD: If you are what I would consider a careful player, I mean that you know exactly how much air your instrument can handle, or whatever the capacity is... Actually, the reed itself, or the reed blocks should last a lifetime. They don't, so to speak, wear out, but they need to be worked on because it's gonna go outta tune. BD: Send it in for your 100-concert overhaul. BD: [Laughs heartily] Is there anything else about the instrument that the public wouldn't normally see or know about? RD: No, you don't do any of that. You certainly have to be careful with the bellows in the sense of any kind of leaks. If the compression isn't there, you can't control your volume or your dynamics, so you have to watch that. You have to watch that you don't spring any keys. If you pull up on a key, you're gonna spring it and that can be fixed, but it's very annoying. You have to be careful about how you take the accordion in and out of the case. BD: You have a hard case for it, I assume. BD: Does it travel well, or is it sort of delicate? RD: It's delicate, and if it isn't packed correctly, the entire bass section can really collapse, or fall in. Then you have a problem getting all of those basses back in their right position. It is very annoying, and can be absolutely terrorizing. So you have to be careful how you pack the instrument and how it's handled. BD: Are there any such things as mutes, or any accessories for the instrument? RD: No, there are no mutes per se. Some instruments would have a built-in mute on the grill. One of the famous makes of accordions was the Excelsior accordion of New York City and they had a mute on the instrument that you could change at will. But that you don't just put it on, it's built-in. BD: Sorta like the boxes on an organ. BD: I don't know of any other touring virtuoso accordion players. Are there others? RD: Yes, yes, there are. One of the great players of today, although he doesn't come to this country very often, is Mogens Ellegaard (1935-1995) of Denmark. BD: I only heard of him a couple of days ago. I got a recording of Nordheim's concerto, and Mogens is the performer on that. It's the first time I'd seen the name. RD: He's a very fine player, and one who has really pushed for original music for the accordion. He's done many pieces written for him and commissioned by him, mainly by European composers. I don't recall any American composers, but he has been touring all over the world for years. Some of the Russian players are some of the greatest players ever. Yuri Kazakov (b. 1924) is just a marvelous player; the Russians utilize a concert instrument they call the bayan, and it has buttons on both sides. BD: Is that like a concertina? RD: No, it's not like a concertina; it's much bigger. It has a similar sound to the accordion, only it has greater range on both sides, and they use it in a concert-type setting. Some of their players, in my judgment, are some of the finest players in the world. BD: Since we're talking about instruments, tell me about the bandoneón. RD: The bandoneón is a cousin of the accordion. The principle is essentially the same, with a free reed, and it has buttons on both sides. To my knowledge, having never really played the bandoneón but hearing it, you don't hear a lotta chord work. You hear a lot of single lines, very appropriate, mainly, for tango orchestras. Ástor Piazzolla (1921-1992), of course, is the great bandoneónist who has exploited that instrument in a concert way, not just playing tangos, but everything. And he, himself, is a fine composer. But the bandoneón, in this country, is practically non-existent, and I'm sorry about that. I know of no one who plays on any concert tours. BD: You play concerts and you teach. About how many accordion concerts do you give a year? RD: Most of my playing, recently, has been as a faculty member at the University of Denver. There, like at any university, you can experiment with new literature. So there's no set number of concerts. I don't play anything like someone who would be on tour. I do, perhaps, six or eight concerts a year. BD: And about how many students of accordion do you have? RD: Don't have many now. At one time I had 18. The accordion is not popular anymore, and it varies from year to year. I have a graduate student now, and I have several other students who are not music majors, but they're studying accordion. But it is not like it was at one time, very popular. BD: Is it going the way of the dinosaur, or is this just a dip, and it'll come back? RD: I wish I could answer that. People ask, "What is the reason for it," and I guess there's many reasons that compound themselves. I hope it comes back. There's always people out there who love the accordion and who enjoy this instrument. Some are players themselves and some just simply like it. I would hope that it's going to come back as a very popular, viable instrument. BD: How are you regarded by the polka band-type players? RD: I don't know, really. I have had very little contact with those players, mainly because I don't play polkas. BD: I just wondered if maybe you were known as the "outsider," or as the "concert player." RD: Well, I probably am because they would say, "He doesn't play our kinda music; he's doing his concert thing." I don't know what their attitude would be. I've never had an opportunity to sit down and talk to any of those players. BD: How do you regard them? RD: If they do a good job at what they're doing, I think it's fine. They enjoy that type of music and it's perfectly fine if you do a good job. And there are some very good players out there. BD: Is there something of a parallel between you and most accordion players similar to Segovia and the rest of the guitar community... a very few serious players, but most of them use their instruments for pop and rock kind of things? RD: Oh, I think so. Certainly many of the students I've had at the University of Denver came there because they're interested in good music and they love the accordion. There have been some wonderful players. William Popp, who was a former student, is now solo accordionist with the United States Air Force Strings in Washington. He's playing all over the world, he's arranging for them, he's a very fine musician, and playing in all kinds of chamber music. But he always had a love of good music! I think you have to like good music, or serious music, to begin with and then exploit it on the accordion. BD: Is playing the accordion fun? RD: The accordion fun? [Long pause, then speaks solemnly, almost grimly] Sometimes. Not all the time. I find that it can be a frustrating instrument. The coordination involved is extraordinary and sometimes that coordination doesn't happen. You just have to work at it. So much of it is coordination, and that's not fun! The use of he left hand and at the same time getting the dynamic range, the volume, is quite difficult. Other times it is fun if you're working with other musicians and you're doin' pieces that you really enjoy. It can really be fun! I played at the Museum of Natural History, which is one of the large museums in Denver. Two years ago they had a wonderful exhibit of the Nomads of Eurasia. I believe Denver, Los Angeles and Washington, D.C. were the only ones that got this exhibit, and the museum called me and wanted nothing but Russian music. I couldn't find a balalaika player in Denver, but there was a wonderful gentleman who plays the mandolin and has a marvelous library. So we used mandolin and myself and double bass. Every Saturday and Sunday we'd simply play Russian music, and that really was fun. We played some Tchaikovsky, but most of it was oriented towards folk music of a very high caliber. And people simply loved it. I couldn't believe the response. I thought it would end up as background music and it was like a little mini-concert every time we played. BD: So people were actually listening to you and taking note. RD: Absolutely. We always had people come up who said, "Oh, we love the accordion," or, "We love the mandolin," "It's a wonderful combination," and so forth. BD: How do you prefer to be called: an accordionist? An accordion player? RD: I think "accordionist" is more proper. There's one aspect of the accordion use that people don't realize, and that is the motion picture industry. The accordion is used many times, but unless you were an accordionist yourself or you're attuned to that instrument, you wouldn't know it's there. But there have been motion pictures where it's been used extensively, such as Moonstruck , with Cher. 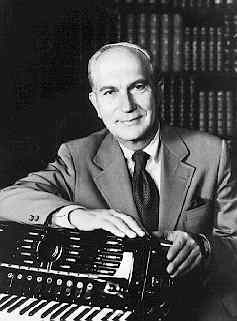 In fact, there was so much accordion there they gave credit to the player, Dominic Cortese of New York (1921-2001), a wonderful player. BD: Have you done some studio and film work? RD: I've done studio work, but I've never done "motion picture" work. I'd love to do that someday. I've done some commercials and industrial films, and I've made some recordings but not under my own name. BD: And you're not credited on those discs? RD: No, because all of it was his orchestra and we were just the 50 players. Henry Mancini has used accordion over the years. The Pink Panther (1963) was full of it. There are so many movies that have used it but you don't realize it because it's used very sparingly. Sometimes it's so blended in with the other instruments that it's difficult to know that it's there. BD: It's just a subtle color. RD: Absolutely. Or it's a harmonic filler. In the days of radio, at the National Broadcasting Company in Denver and then at CBS in San Francisco, they used it as a harmonic filler. If you had six players, for instance, you just filled out that whole group of instruments. BD: Are you optimistic about the future of accordion playing? RD: [Takes a deep breath] Well, on one side of the coin I am; on the other side I sometimes have questions because of the fact that there aren't that many people, at least in my experience, that are interested in pursuing serious music on it. I think that perhaps it might come back more in a more popular way with the various ethnic types of music you hear today. There are zydeco bands; the Louisiana-type Cajun-type of music that they use it for; they use it in Mexican bands. I don't know, really, whether there'll be a turnaround or not. There are so many instruments today that you can almost duplicate with a synthesizer. I get the feeling that the accordion can be duplicated fairly well with a synthesizer, so I don't really know. I wish I could answer that more positively. BD: Well, I'm glad that you've come back to Evanston to give a concert. RD: Thank you. I'm very pleased and honored that Northwestern has asked me to come back and play, and I'm looking forward to it tomorrow night. I just am very thrilled about the whole situation. Robert Davine (April 5, 1924 - November 25, 2001) was a professor and theory department chair at the Lamont School of Music at the University of Denver. He was acclaimed as a true virtuoso of the concert accordion. He is one of the few gifted musicians whose artistry released the exciting range of tone and color intrinsic in the character of this unique instrument. An artist with an international reputation as a distinguished soloist, chamber musician and teacher, Robert Davine held degrees from Northwestern University, and studied with Andrew Rizzo, Robert Delaney, Joseph Biviano, and John Serry. Mr. Davine performed as soloist with the Denver Symphony Orchestra, the Pittsburgh Symphony Orchestra, the Mantovani Orchestra of London, the Paganini String Quartet, the Norwegian Broadcasting Company, Oslo, the Aspen Music Festival Orchestra, the Flagstaff Festival Orchestra and the Lake Superior Chamber Orchestra. For many years he was staff accordionist for the National Broadcasting Company. In 1984 he was invited by the Ministry of Culture, People's Republic of China, to perform and give master classes, and many Chinese music students came to DU afterward. His artistry has inspired new compositions by composers Normand Lockwood, Cecil Effinger, Max DiJulio, Jean Berger and Wendel Diebel. He has been honored as Faculty Member of Distinction and Alumnus of Distinction at Northwestern University. In addition to teaching and performing, Mr. Davine was engaged in writing a book on the history of the accordion and its literature. He recorded for the Crystal Record Company. In 1954 he founded the accordion program at the Lamont School of Music. Theoretical studies include working with John Kirkland, Anthony Donato, Robert Delaney, Philip Werner and Frank Cookson. He researched and wrote articles on the music on India and the works of Bernard Molique and George MacFarren. During his tenure at Lamont, Professor Davine developed graduate seminars in analytical techniques as applied to twentieth century composers. As a 10-year-old in 1930s Denver, Davine encountered the accordion as an accompaniment for a Spanish dance troupe. By the 1950s, "every kid on the block'' had an accordion, Mr. Davine said in a recent interview with the Rocky Mountain News. In 1954, Mr. Davine married Jacqueline. She survives him, along with his son, Greg, of Greenwood Village; daughter, Lynn Carolus, of Parker; brother, Fred, of Greenwood Village; and four grandchildren. 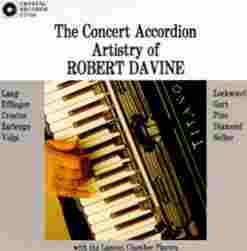 The accordion's popularity waned as Lawrence Welk gave way to zydeco, but Mr. Davine stayed true to the rare concert accordion. He elevated it to an instrument that would accompany orchestras and quartets, and headlined performances of music by Tchaikovsky, Mantovani and other composers. Such modern composers as Normand Lockwood wrote music - 11 new compositions in all - specifically for Mr. Davine. Never a squeezebox elitist, he taught popular accordion as well as the concert accordion for jazz and classical music, said Anne Culver, former director of DU's Lamont School of Music. Mr. Davine inspired a lifelong love of music in his children, said his son, Greg. "There was always music in the house.'' The musicians who helped him win DU's Distinguished Teaching Award in 1999 lauded Mr. Davine for his musicianship, his dedication and his ability to relate to students through several generations. "A master musician and a superb instructor'' is how David R. Lindsey, music instructor at North Texas State University described Davine, who taught him from 1950, when he was 12, to 1966, when he won his master's at DU. "There are performers, professors and deans, all of whom owe a debt of gratitude to Robert Davine,'' said Robert Yekovich, dean of the school of music at the North Carolina School of the Arts. This interview was recorded in Chicago on April 27, 1992. Portions were used (along with recordings) on WNIB in 1992, 1994 and 1999. This transcription was made and posted on this website in 2008. To see a full list (with links) of interviews which have been transcribed and posted on this website, click here. Award - winning broadcaster Bruce Duffie was with WNIB, Classical 97 in Chicago from 1975 until its final moment as a classical station in February of 2001. His interviews have also appeared in various magazines and journals since 1980, and he now continues his broadcast series on WNUR-FM, as well as on Contemporary Classical Internet Radio. You are invited to visit his website for more information about his work, including selected transcripts of other interviews, plus a full list of his guests. He would also like to call your attention to the photos and information about his grandfather, who was a pioneer in the automotive field more than a century ago. You may also send him E-Mail with comments, questions and suggestions.